Restore: Savings curriculum equips churches and ministries with tools to start savings group ministries. Savings groups help people in extreme poverty weather the storms of life. In a savings group, people gather weekly to worship, study God’s Word, and pray. Every week, each member also contributes a small amount of money to the group. With the money they save together, members can invest in their businesses, pay for healthcare, or purchase necessities for their families. 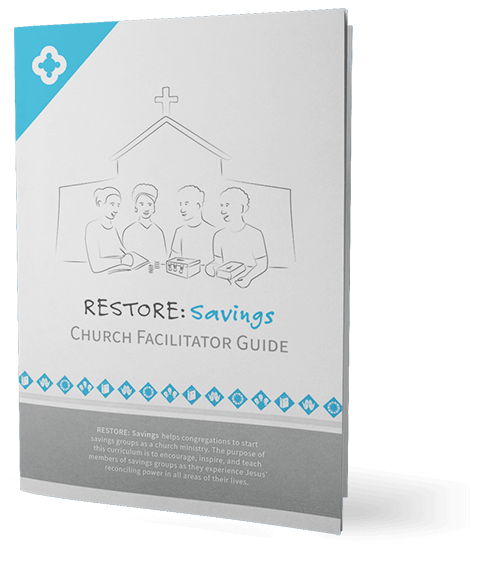 The Restore: Savings Facilitator Guide is available by request as a free download. Fill out the form below to get your copy! I am downloading this resource for my own use or the use of my church or organization for the purpose of ministering to people in poverty. I am downloading this resource for usage with no more 9,000 participants. For organizations or church networks serving more than 9,000 participants, please contact the Chalmers Center for licensing options and additional consultation. I understand that this resource is owned by others and has been shared to support holistic economic development. I agree to not sell, publish, duplicate or distribute this resource for a fee or financial consideration. I agree to not translate this resource into any other languages without permission from the owner. I agree to not alter this resource in any way and to ensure that copyright, brand, and authorship are retained on the resource. I understand that the owner of this resource can revoke the rights of use if I am found violating this agreement. I have read and agreed to the International Curriculum Agreement.